What is a Digital Multi-Point Inspection? Glad you asked! Digital Multi-Point Inspections are just like your traditional, written multi-point inspections, except everything is recorded digitally on a tablet. Digital inspections change everything. Through the use of mobile technology, you can customize inspections to do a simple tire report or a full bumper to bumper, multi-point inspection. And you know what? The more you document, the more likely your shop to up-sell services. Customers are more confident when they can clearly see the condition of their vehicle in an easy-to-understand format. When you add photos and videos to your digital inspection, customers will be able to see what your talking about, understand it, and say YES to services that are recommended! There is a whole new level of trust built as a result of using digital multi point inspections. Learn more ways to Gain Customer Trust (and How Not To). How Does a Digital Vehicle Inspection Work? Paper inspections are out-dated. Increase productivity in your shop by eliminating all of the scribbles on paper inspections and integrating inspection results from a mobile tablet directly into your shop management system. BOLT ON TECHNOLOGY has taken all the same steps that techs are already accustomed to and digitized it! Same method, only easier, more efficient, and more productive. 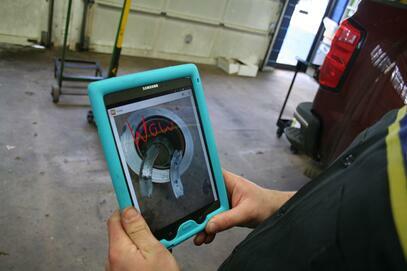 On your tablet, tap your way quickly through a vehicle inspection, typing notes as you go. Add photos and videos to better explain the current state of their vehicle, as well as show your customers why repairs and services are recommended. Once completed, simply text or email the digital inspection to your customers to get work approved almost instantly. Instead of paper, the multi-point inspection is now performed using a mobile tablet. You can build and edit your own inspections that when chosen, will appear on the tablet for the technician to use. Taking pictures and videos is the easiest way to educate your customers on the "why" of services. Keep in mind, the best inspections will show the good and the bad. Draw on the pictures to point out specific areas and include a variety to help build a history of the vehicle. Over time, customers can see comparisons and past recommendations. Pictures and videos clearly illustrate the vehicle’s needs and will support the customer in making the best informed decisions for their vehicle. Once completed, the service advisor immediately sends the inspection directly to the customer’s phone for them to look it over with just a click of a button. Legibility: First and foremost, with digital vehicle inspections, everything is easier to read. No more chicken-scratch, no more misspellings, no more indecipherable codes or shorthand. Everything is clearly typed out for everyone to read and understand. Consistency: When everyone is filling out the same pre-built inspection form with the same pre-built canned jobs, everything is consistent. That means work can be easily categorized, and your monthly reporting becomes more accurate! Efficiency: With the ability to select pre-built jobs, your techs are saving time writing the same service descriptions. Instead, digital inspections include a simple “click to select” method that saves time on inspections, meaning you can now get more inspections done in a day. Effectiveness: A pictures worth a thousand words - and an increased ARO. Digital inspections allow you to send pictures and video to your customers via text message, making communication faster and repair suggestions easier to understood. Showing your customers exactly what is wrong with their vehicle gives them power and makes them feel like they are now an expert. They won’t feel swindled or taken advantage of, giving you the ability to up-sell necessary repairs and build trust for repeat customers. Productivity: When you take all the listed benefits above you get one awesome result: productivity. That's what every auto repair shop dreams of and works towards! To learn more about digital inspections, read What to Consider When Choosing A Digital Inspection Software. BOLT ON TECHNOLOGY is the industry leader in automotive shop management software. We have designed top-notch technology for automotive repair shops everywhere. Our software bolts on to your current shop management system and increases your shops overall productivity and raises your auto repair shop’s bottom line. But don’t take out word for it, hear from our customers how much their shop has grown since using BOLT ON TECHNOLOGY. Interested in Digital Multi-Point Inspections?